Interconnector imports and LNG send-out have changed from 4.6% and 17% of total gas supply in February to 0.1% and 20.6% respectively in March. The day-ahead NBP gas prices have been pushed to almost two-year lows (31.3p/th) and summer 19 gas to the lowest since 2016 (35.5p/th). 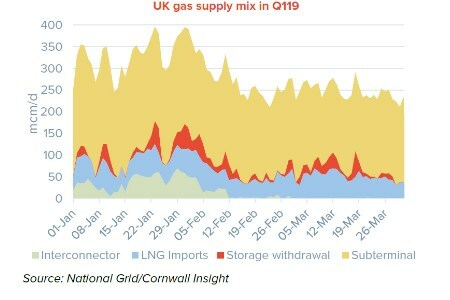 Alex McGregor, Analyst at Cornwall Insight, said: “The tide is starting to change on the UK gas supply mix, due to an increase in LNG tankers arriving in GB terminals over the quarter with 41 LNG tankers in Q119, up from eight in Q118. The global market has been oversupplied amid weak Asian demand for the super-cooled fuel and new LNG projects in the US and Australia flooding the market with additional supply, which is driven to the UK. “Weak demand in Asia has pushed Asian LNG prices to near three-year lows, falling below the price of day-ahead gas in key European gas hubs in the middle of March, and signalling LNG traders to chase better prices in Europe compared to Asia. “The global nature of the LNG market allows the UK to take advantage of lower international gas prices rather than being anchored to our neighbours in Europe. The influx of LNG traders has been the key driver in pushing both the NBP day-ahead and summer 19 gas prices down. “As summer approaches, National Grid are forecasting total UK Gas demand in summer 2019 to be higher than 2018. This is due to predictions of increasing transit gas flows into Europe, as prices drive greater volumes of LNG to GB terminals.